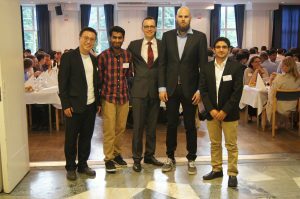 The 12th edition of the triennial IAFSS Symposium was held at Lund University, Sweden this year. Four members of the Aalto fire research group, headed by Prof. Simo Hostikka, were present at the symposium to share their research with the fire science community. Prof. Hostikka spoke about “Heat and mass transfer in the condensed phase” in the Condensed phase subgroup of the MacFP workshop. Dr Kaiyuan Li presented his paper about “Char cracking of MDF due to thermal shock effect induced pyrolysis shrinkage“. Rahul Janardhan, PhD student, presented the paper from the PAHAHUPA project titled, “Fire induced pressure and smoke spreading in mechanically ventilated buildings with air tight envelopes“. fire-barrier temperature: Simulation and validation of a fire experiment”. Also, Topi Sikanen from VTT Technical Research Centre of Finland presented his paper on “Predicting the heat release rates of liquid pool fires in mechanically ventilated compartments“. ← Will the induction cooktops wipe out kitchen fires?